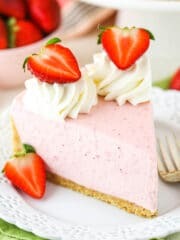 This Strawberry Cheesecake is super easy to make and even easier to share with your family friends! It’s smooth and creamy, and topped with delicious strawberries and sauce – a perfect summer treat! The only thing that could make a weekend better is sitting down with a pan full of this Easy Strawberry Cheesecake! 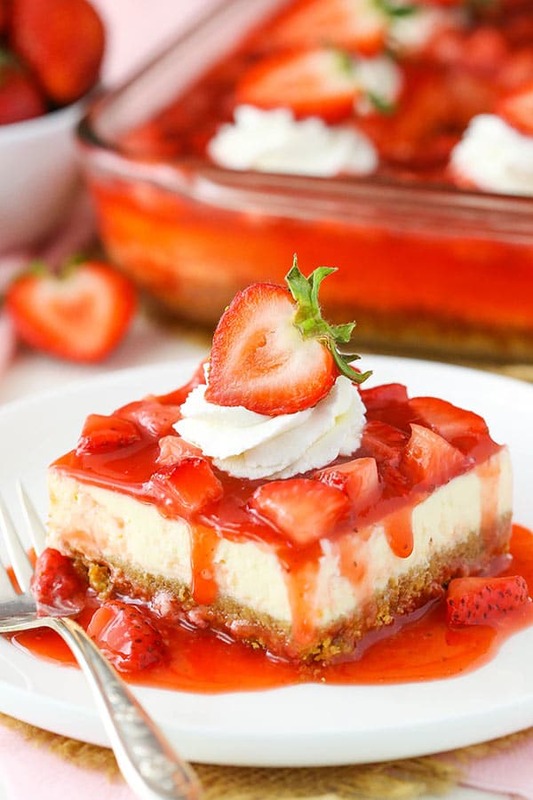 It’s got all the things I love – a good thick crust, super creamy vanilla cheesecake and it’s covered in strawberry sauce and strawberries. No joke, I could demolish this thing. Just pass me the pan and a fork! If you think you’ll feel the same way, you should totally whip it up. It’s such an easy cheesecake to make. I love making my beautiful round 9 inch-ers that are nice and fancy, but sometimes fancy is unnecessary and more than you want to deal with. Plus, baking in this 9×13 pan makes it especially easy to transport for sharing. And isn’t summer all about getting together with friends and sharing? I think so. So to put the cheesecake together, we start with the graham cracker crust. A total classic! I like to add a touch of sugar to sweeten things up because I’m me and I like things sweet. No surprise there. 🙂 Plus, it really does make the crust just that much better. Next you’ve got the cheesecake filling. Pretty straight forward, just try not to over mix things too much. You’re more likely to add air bubbles to your batter and get cracks, although this cheesecake should do a good job of not cracking. 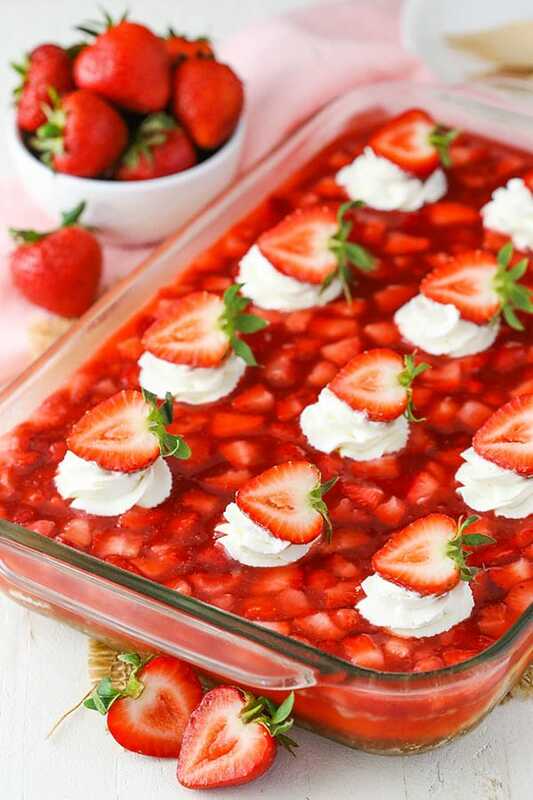 The topping is the most delicious homemade strawberry sauce with fresh chopped strawberries! It’s not super thick like Jello, it’s more like a sauce. 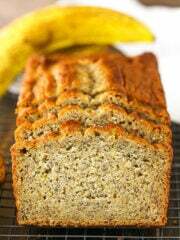 It’s baked right on the stove and the longer it cools after cooking, the more it thickens up. If you prefer an even thicker sauce, feel free to add another tablespoon of cornstarch and cook it a bit longer. 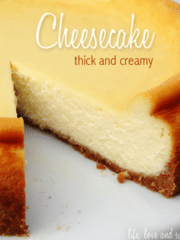 Either way the flavor is amazing and SO good with the tasty crust and creamy cheesecake. 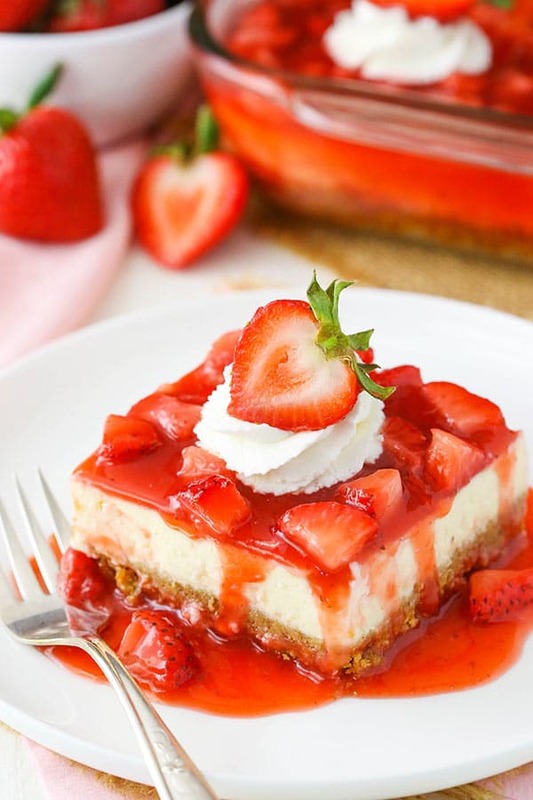 This Easy Strawberry Cheesecake is a delight to eat! So summery, light and fresh. Grab a fork and dig in! 6. Add the sour cream and vanilla extract mix on low speed until well combined. 13. To make the strawberry topping, combine the sugar and cornstarch in a large saucepan. Stir in the strawberry puree. 14. Cook over medium heat, stir constantly until mixture thickens and come to a boil, about 15 to 20 minutes. 15. Allow to boil for 1 1/2 minutes, then remove from heat. 16. 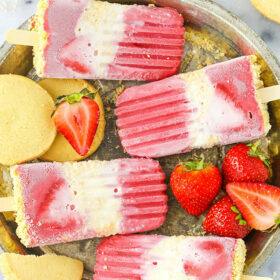 Stir in vanilla extract and chopped strawberries and allow to cool for about 15-20 minutes. 17. Pour the topping over the cheesecake and allow to cool completely, 3-4 hours or overnight. You could serve the sauce immediately, but it will thicken as it cools. 18. To make the whipped cream, add everything to a large mixer bowl and whip on high speed until stiff peaks form. Serve slices of the cheesecake with the whipped cream, if desired. Yes, I’m sure it’d be awesome on ice cream! Lindsay you’ve done it again! I absolutely cannot wait to try this recipe out!! 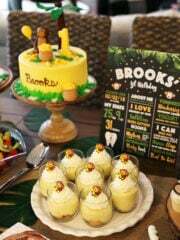 Lindsay – I’m big on presentation and I love the 9×13 with the rows of heart-shaped strawberries with dollops of whipped cream. Thanks for sharing! 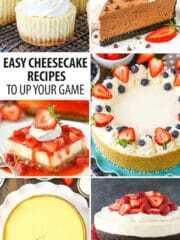 I can upon your blog while searching for cake recipes and I’m so impressed!!! I signed up to your news letter and received this cake recipe today which I’m going to try out for my son’s birthday next weekend. I am not good at baking but I’m hopeful. I don’t have a food processor and was wondering if an electric hand blender, at what speed should I use it? Thanks Marvis! I’m not sure, I’d just crush them up into crumbs – whatever speed you need for that. Do you think this could be done individually in cupcake cups? Thanks! It looks delicious! Here is something similar in cupcake form. Amazing recipe I tried this today and cut down on the sugar for the strawberry sauce by 100gram and no sugar in my whipped craem too. Everyone in my family loves it. I still have the strawberry sauce and the filling left. How many days can they hold in the fridge as I would like to make this into cupcakes on Monday. WOW! 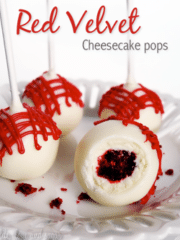 This looks amazing..I am making this for 4th of July BBQ..ITS EASY TO MAKE..BUT TIME CONSUMING..I will let you know how it turns out!..thank you for posting..I dont like to cook..Im not good at it..but I do like to make amaaazzing desserts with clear directions..You did an awesome job from step 1..Thank you THANK You! How do you make the strawberry purée? 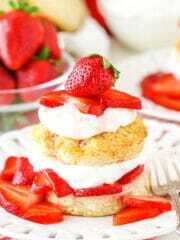 Just add strawberries to a food processor and puree them. will blending be the same? Yes, a blender would be fine. So you don’t add sugar to the strawberry puree you just pure strawberries only correct? Yes, just puree the strawberries. Sugar is added when you make the topping. I’ve never tried baking it alone. Is it the same if you water bake it? Oh My! 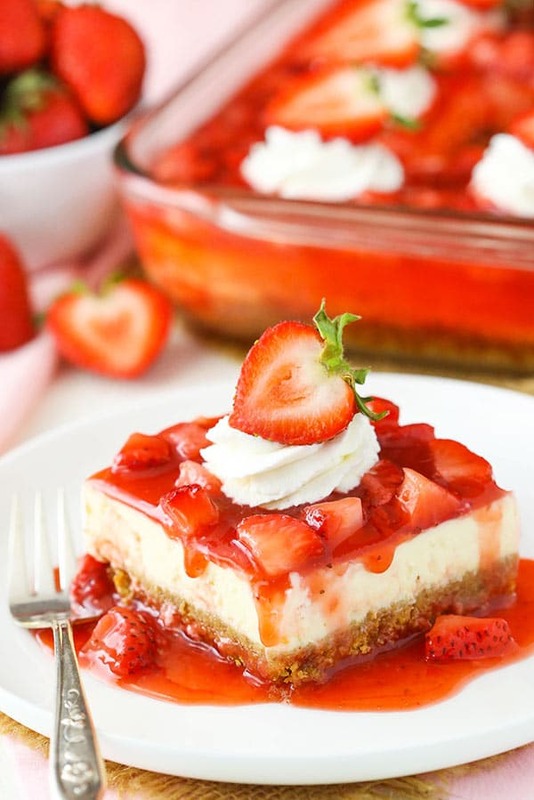 I made the cheesecake last night and been in the refrigerator….just made the sauce and it is wonderful….cant wait to put it on the cheesecake and take to friends for dessert later! I guarantee it is going to be a hit! I’m so glad you’re happy with it! Thanks Carolyn! I will adjust the amount of strawberries to 1lb since that is what this recipe calls for. Hope this helps! Question. 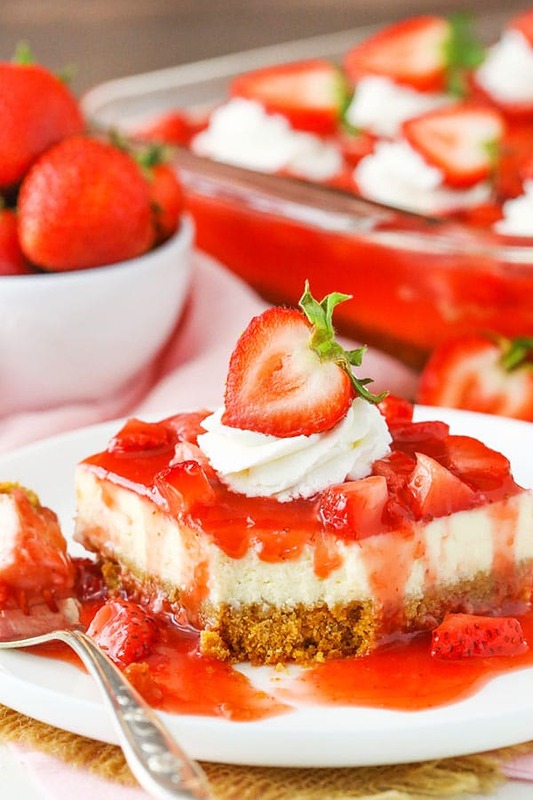 Do you have to let cheesecake cool the 3-4 hours before adding the strawberry sauce and cool another 3-4 hours? It’s up to you. The recipe is written that way, yes. 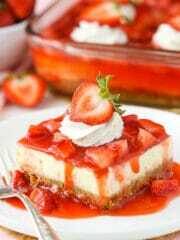 But if you’d prefer to serve the cooled cheesecake with strawberry sauce warm on top, you certainly can. 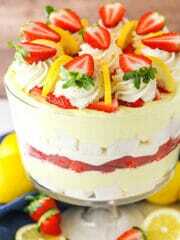 This is a wonderful dessert! The cheesecake is so smooth and creamy. Your instructions for the cheesecake were great and was the best I’ve ever made! My family went crazy over it . thank you for sharing. I’m glad you enjoyed it! Thanks Sandy! I made this today and it was super Yummy!!! Thanks for posting it! I’m looking to make this recipe as a gift for a friend of ours, and was wanting to make it easy and bake it in a disposable pan. Would that work? Or would that affect the baking times, etc? And could you half the recipe and make it in an 8×8 pan? I haven’t ever made a cheesecake in a disposable pan, but I would think it’d be fine. And 8×8 should be ok.
i wanted to ask you if you are making this in an 8×8 pan, are you suppose to change the cooking time? I don’t think I’m suppose to cook it that long or it will burn. Im making 3 in 8×8 pans but i wanted to know how to adjust the cooking time and the ingredients? I wanted to make this for my family for thanksgiving this year. Please if you could help me adjust i don’t want to make it wrong or mess it up looks to amazing.Please HELP!!! Please and thank you so much. P.s. you just gained a new fan! Cutting it in half might give you a little too thin of a cheesecake, so you might want like 2/3 of the recipe. Baking time wouldn’t be too much different – maybe 20-25 minutes. I used tried this recipe but used it on a cupcake pan! And it turned out so yummy!! How soon ahead can I make this cheesecake? It’s Monday and I want it for Thanksgiving on Thursday. Thanks. 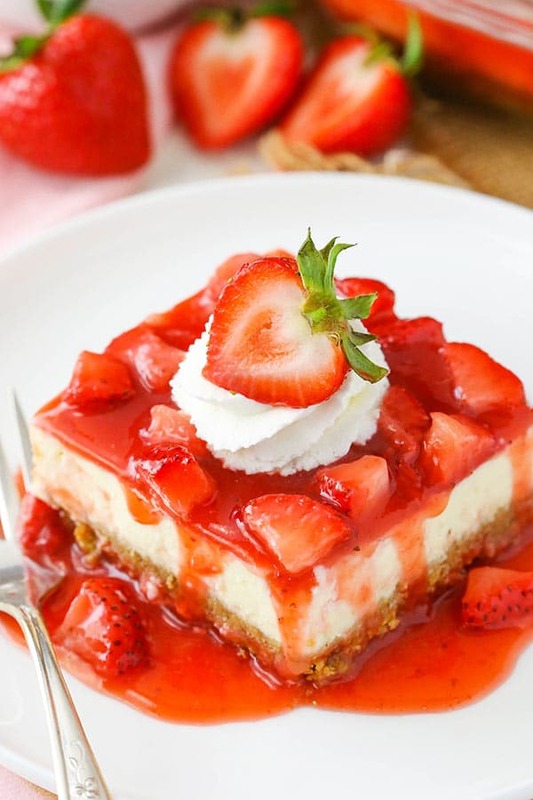 The cheesecake will be fine for a couple of days, though I’d recommend adding the strawberry topping either the day of or the day before you are going to serve it. OMG, this is simply the best cooked cheesecake I’ve ever made and possibly even eaten! The texture is perfect, not too heavy, not too light and so creamy. I didn’t put sugar in the base as I used Digestive biscuits which are sweet enough plus used half the sugar in the topping and it was more than sweet enough. Next time I’m going to try using lemon zest and juice instead of vanilla and also put the fresh strawberries on top of the glaze instead of in it. I think that will help cut through the lovely richness of this dessert. how many eggs pls ? There are 3 eggs listed in the ingredients for the cheesecake. This was a fabulous cheesecake ! It turned out so creamy . I brought it to a lunch party and everyone loved it , most of them had seconds!! Wonderful! So glad it as a hit! Yes, you’d want to bake the cheesecake for more like 1 hour and I’d probably suggest a waterbath. 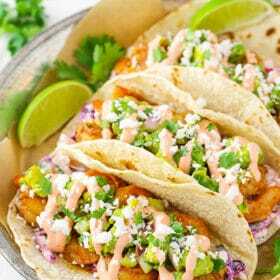 There’s no sour cream where I live, would the recipe be okay without it? I would love to try out this recipe! You could try replacing it with some yogurt. Hi Lindsay! 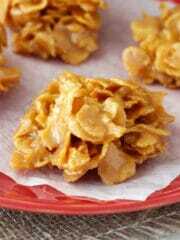 Chanced upon your recipe, looks great & I am really hoping to make it next week for a special occassion. Just a question about the baking temperature – you stated 163°C then turned down to 148°C, may I know at which oven setting (I normally bake my cookies at 180°C ‘upper/lower heat’ setting), or is this fan setting – which is normally 20 degrees less, eg some of my cakes i bake at either 160°C FAN or 180°C upp/lower heat… which temperature setting is yours? Thank you so much! Hmm, I’m not sure. My oven doesn’t seem to have those same settings. It’s an electric oven. It’s upper/lower heat setting! I already made it 3 days ago – followed your recipe for the crust & filling steps (with some tweaks in the ingredients list) & did my own topping with raspberries, all turned out great, thank you! I have made the strawberry cheesecake twice now and have gotten rave reviews. It’s an easy recipe mand love making it. I haven’t tried this yet, but I plan on it on Thanksgiving. My question is, that in this recipe it said “vanilla” did that mean vanilla extract? Yes, vanilla extract. I hope you enjoy it! Thank you so much. I cant wait to make it. One more question. Could you use vanilla wafers instead of Graham crackers? Hi there, I tried this and everything turned out great, except the sauce! It tasted great, but it looked nothing like yours. It quickened quickly on the stove, and it was pink! Lol. Was I meant to put liquids in the purée? Or maybe I’ll adjust the amount of cornstarch next time. Everyone says it was it delish, so it was a win. Hmm, pink? I assume it was red before you added the other ingredients? Considering it thickened quite a bit, I’m assuming maybe you used more cornstarch? That would be the only thing that would lighten the color as well. I’m glad everyone enjoyed it! I made this and it was beyond delicious! I was wondering if I can use this same recipe for a strawberry “jam” to put between 2 layers of cake? Or will it make the cake mushy? I’m glad you enjoyed it! 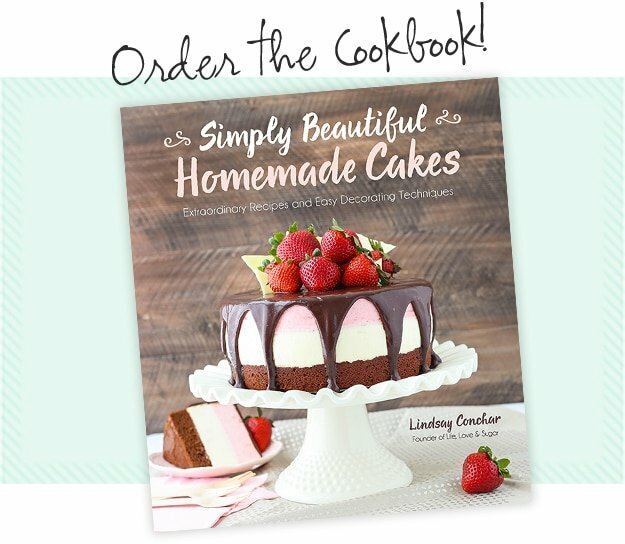 If you were going to put something between cake layers, I’d check this recipe out. I used mixed berries, but you could easily use all strawberries. Do you think I would be able to make this recipe into vegan? removing the eggs and using the egg replacer since I already have the vegan sour cream margarine instead of butter? I haven’t ever worked with egg replacers, but I’d guess it’d be fine. Fresh strawberries like the Driscoll ones are hard to comeby in my country. The local produce are small ones. Can I use frozen ones? Frozen would be fine. I would just thaw them and pat them dry before using. This looks amazing! For the sauce, will it be okay to make it, put it in the fridge overnight, and then place it on top when ready to serve? Thanks! I want to know if the sugar can be replaced with Splenda. We have diabetics in the family. I haven’t tried it, but would think it’d be fine.